Competing for Global Dominance � learn how to find new ways to grow product sales while increasing market share. Competing for Global Dominance: Survival in a Changing World. Jack S. Katz, is identified as one of the ten top people to know by Technology Decisions Magazine, Jack is noted for his knowledge and delivery of accurate high technology and business solutions that have had a dramatic impact on the bottom line of global companies. With over three decades of Information Systems Management, Marketing and Business Development experience in such diverse industries as Retail, Healthcare, Financial Services, and Information Technology, Jack is an internationally recognized author, speaker and business technology expert. Jack co-founded Red Hill Partners International, LLC a premier market-entry company which works with emerging companies to define, develop and expand their products and services worldwide. He has previously held senior level management positions with Cisco Systems, Sun Microsystems, Providian Financial Services, Blue Shield of California, and Safeway, Inc. Survival in a Changing World. 'Competing for Global Dominance' sets the stage for a new paradigm required for growth of the globalized market in the 21st century and outlines the issues that entrepreneurs and businesses will face as they compete for survival in a world marketplace no longer hindered by time and distance. As the Silicon Valley success model moves into its adolescence and transforms its methodology more into using social and business networking as demonstrated on web sites of Facebook, YouTube, LinkIn, LinkSV, Twitter, Ecademy where groups of individuals and businesses from around the world can meet, communicate and collaborate together to expand their influence and market share by developing new ways of doing business. But before this can be effectively accomplished, a new approach needs to be established for how to compete, grow and survive in this new globalized environment. Many governments, educational and private organizations have tried to duplicate the success of Silicon Valley with limited degrees of success, most without really understanding the new dynamics of global competition and how to enter new markets. This book shows the thought leadership from a practitioners viewpoint who works with entrepreneurs and companies from around the world to position them for survival and expansion in the new world of globalization. You aren't just competing with your neighbors selling a goods or service any more, you're competing with the entire world. "Competing for Global Dominance" is a powerful and thoughtful resource for entrepreneurs on the global stage. "This critical assessment of international business practices unlocks the paradigms of our global economy and the significance for global partnerships to succeed in our ever changing twenty-first century economy." New hope for a world in crisis. For most corporate executives--even for those working in large multinational companies Globalization has been a buzzword of vague content, generating more fear than hope. Following a global crisis, we now need to address survival in a changing world. 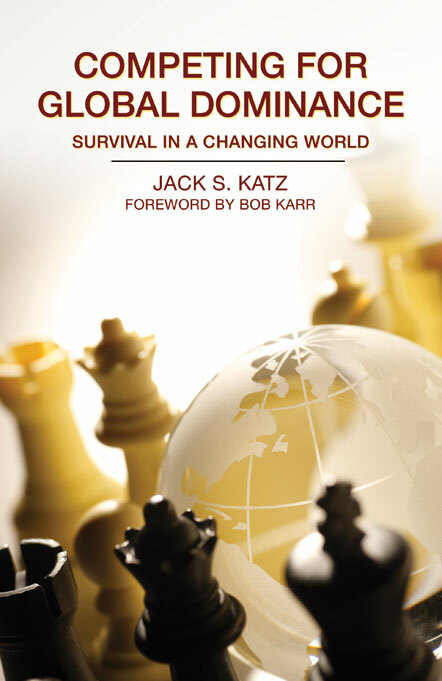 With Competing for Global Dominance, Jack Katz brings to the business world some of the most vital keys for global trade, offering a serious and refreshing insight into market entry options, worldwide sales and global advantage. When most companies are still focusing on traditional markets and business practices, Katz is uncovering new marketing techniques and international trades for the twenty-first century. This very factual and practical book is a must read for all of us in international business looking at the future for new opportunities and global strength." "Jack Katz presents a comprehensive guide for businesses that are either contemplating entering the U.S. market or have already begun the process. In his book he lays out the foundational legal, cultural, and financial strategies for success. Too often foreign businesses do not appreciate how much time and money can be lost without a comprehensive guide like this showing them the way. I highly recommend this book to my clients--both domestic and international." Innovative companies have demonstrated that to maintain their market position for the long term base their tactics for winning on customer value and on flawless execution. These companies take full advantage of market timing, test trials, expert guidance, strategic and tactical planning that will eliminate errors and problems before hand, maximizing the potential for achieving a successful outcome. They also understand that to compete for global dominance they have to develop their products from the outset for the international market and to execute different tactics for each specific country. Successful global companies have gained an understanding of the world around them and know how to exploit that knowledge to their advantage. Global business players, those multinational companies which have gone offshore, have already adopted a lean business model striving for the lowest cost structure, automating any and all operations, focusing on quality, relying on knowledgeable experts in the countries they are dealing with, and providing inexpensive and quality customer support and service all to stay competitive. It is no longer only those companies that have deep financial pockets that can assume the risk required to expand their goods and services worldwide, any company can now build the required infrastructure at low cost to support market development while building their international supply chain - expanding their products and services worldwide. The world economies now depend on a shared sense of mutual benefit among companies to sell uniform goods and services across multiple borders. If globalization is the process by which the experience of everyday life is becoming standardized around the world and where the patterns of production and consumption are resulting in the homogenization of culture, then we have never experienced this trend before throughout the history of mankind. How to compete and thrive becomes the major goal for businesses worldwide.